Prince Harry has returned to Lesotho, the southern African country where he set up a children’s charity seven years ago, and he’s been getting handy in the kitchen! 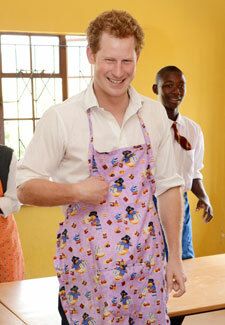 The 28-year-old prince joined children in a home economics class, donning a pinny and showing off his baking skills. We bet he makes a mean Victoria sponge. As well as baking, Harry met pupils at a school for the blind and watched a game of five-a-side football. Prince Harry said he hoped his mother Princess Diana would be ‘proud’ of his campaign to help vulnerable children. The three-day trip marks the launch of a £2.4 million fundraising campaign to build the first permanent centre for children and young people infected with, or affected by, HIV and Aids in Lesotho. It’s part of the work of his charity Sentebale, which he set up with Lesotho’s Prince Seeiso in 2006. His charity’s name, Sentebale, means forget-me-not – and from the smiles on the faces that these children it looks like they won’t forget their visit from a British Prince in a hurry.